Creative innovations in residential wine room design and construction help build an efficient climate control wine storage space, that is functional and aesthetically pleasing at the same time. 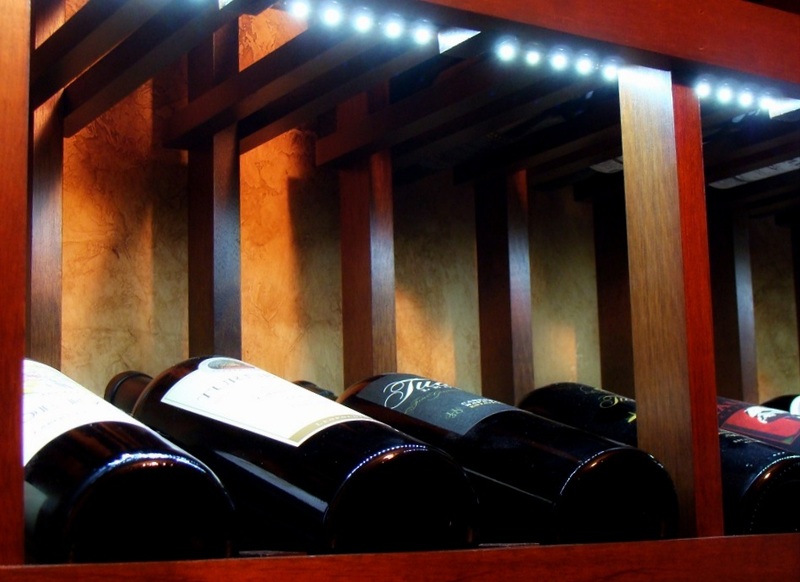 Using unique construction materials and design elements, as well as integrating custom designed artwork, can greatly enhance the interior of a wine cellar space. The recently completed Coto de Caza wine cellar conversion project in Orange County, California demonstrates how wine cellar innovations by Coastal Custom Wine Cellars made wonderful changes to a small closet space under the stairs. 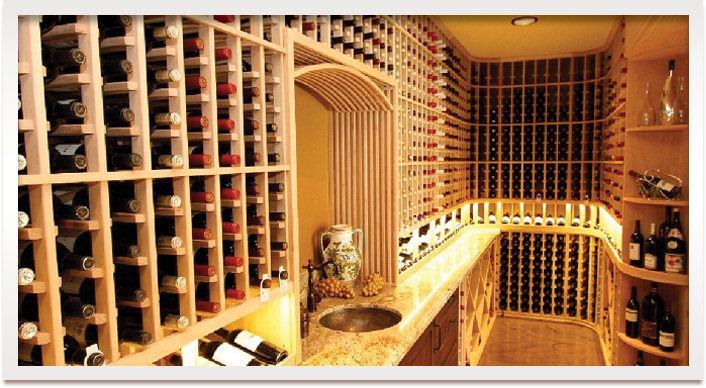 The custom design created a unique and elegant wine room, that provides optimum wine storage capacity. 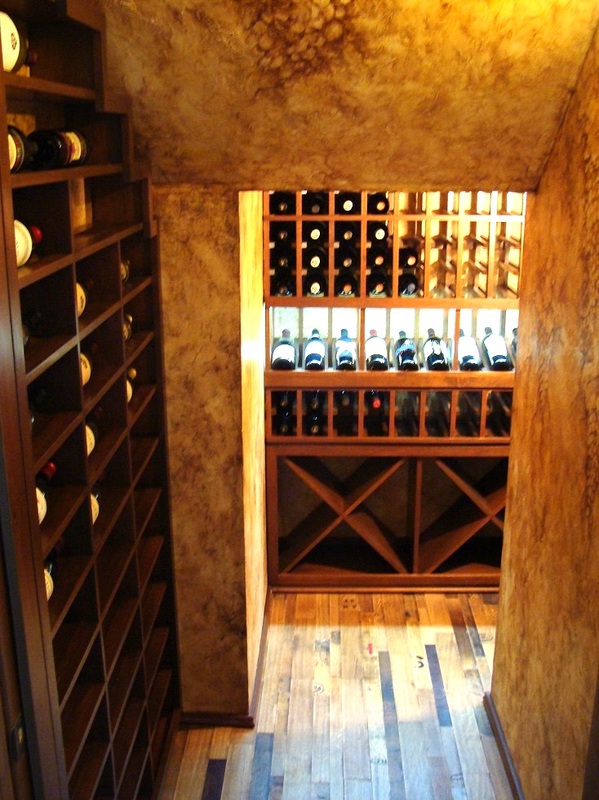 This particular project converts an under the stairwell closet into a 404 bottle capacity custom wine room. What really makes the Coto de Caza residential wine room project stand out is the faux painting integrated on its interior walls, which was created by master impressionist artist Janina Pazdan. 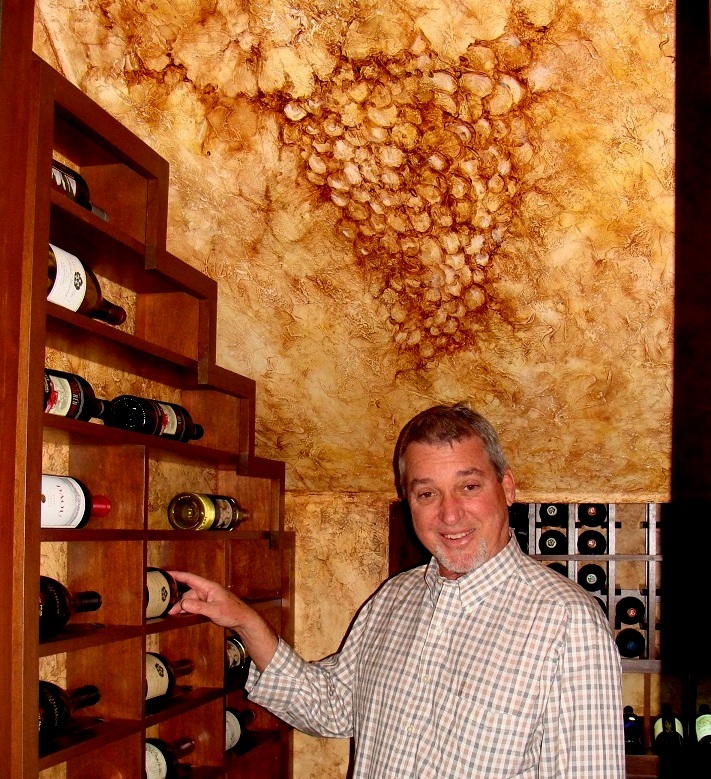 The artist did a beautiful grapevine themed design that provided a distinct appearance, and lent a unique character to the custom wine room. Janina Pazdan was born and raised in Poland. She finished her studies at The Academy of Fine Arts where she spent a decade honing her skills in drawing, oil painting, pottery art, and sculpting. Her impressionistic style is mostly influenced by several impressionist masters, such as Diego Velazquez, Edward Monet, Vincent Van Gogh, Edgar Degaz, and Henre Toulouse-Lautrec. Aside from the grapevine themed painting, the cooperage wine barrel flooring is another wine cellar innovations idea that was added to the residential wine room. 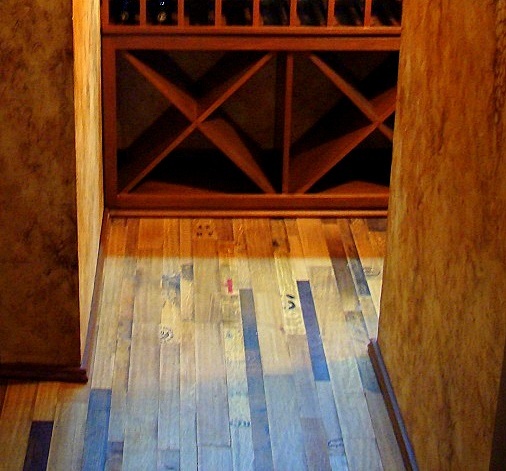 This flooring material is made out of reclaimed oak wine barrel components. Reclaimed cooperage flooring displays stampings and markings of the corresponding winery. Since no two barrel components are the same, recycled oak barrel flooring not only creates a distinguished look, but also brings a nostalgic vibe to the residential wine room. The rustic appearance of the cooperage wine barrel flooring blends well with the Chappo-stained Philippine mahogany wine racking systems. 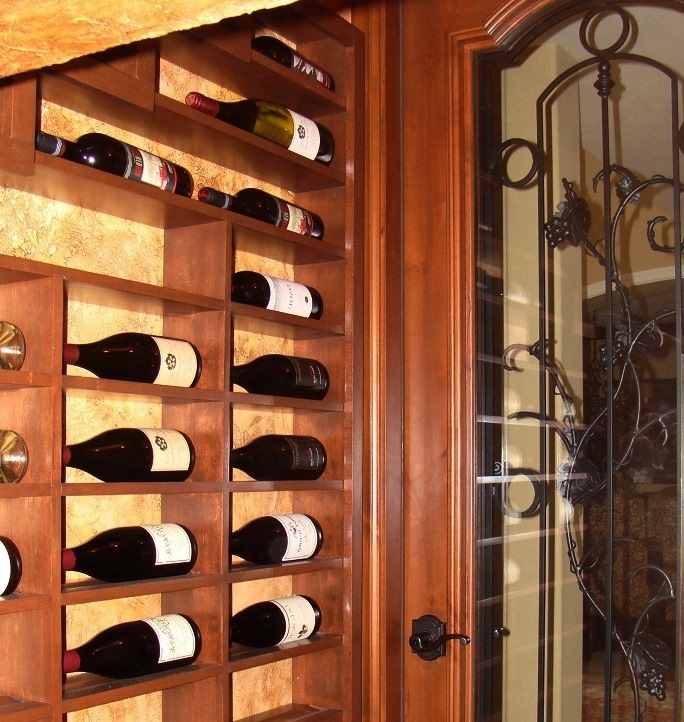 Although the custom wine room had very limited space, the right combination of custom wine racks helped maximize storage capacity of the small, L-shaped wine room. The left interior wall of the residential wine room Orange County custom wine room deep horizontal label forward wine racks in a stair step down design, to accommodate the change in ceiling height. Horizontal wine racks lay the bottles sideways, and not only offer clear visibility of wine labels, but also help prevent the cork from drying out, by keeping it in constant contact with the wine. The enclosure to the Coto de Caza wine closets project is tall enough for anyone to maneuver around, but it quickly drops to a height of 64 inches. Beyond the enclosure is the back wall, that features a combination of single bottle storage racks with display rows and X-bins. Openings for single bottle wine racks measure 3 3/4″ x 3 3/4″ which can hold just about any bottle size into the slots.